For various reasons, I have decided to put the blog on hold for the foreseeable future. I hope to return to it eventually. I will continue to update the timeline when I can do. I can still be contacted at macalister.history@gmail.com with comments or research questions regarding the Macalisters and their history. On the 19th July 1790, a meeting was held at Inveraray of the freeholders of Argyllshire, who gathered to choose the shire’s representative for the upcoming parliament. Among the attendees listed is Angus Macalister, 11th of Loup. In the Scottish context, a freeholder was a tenant-in-chief — someone who held his lands directly from the king. This had nothing to do with the landholder’s local prominence or personal wealth. Many well-established families in Scotland held their lands from one of the king’s vassals rather than from the king himself — including the Macalisters of Tarbert, who were vassals, or subtenants, of the Campbells of Argyll. The Loup family itself held some of its properties from the Macdonalds of Dunyvaig in earlier times, and later some from Argyll. But the Macalister chiefs’ position as freeholders was important. William Ferguson tells us that “by the late seventeenth century the term [freeholder] was used mainly with reference to the electoral system, the freeholders or barons constituting the county electorate”. In fact, “[o]utside the burghs virtually all Scottish voters” belonged to this group, according to Margaret Sankey and Daniel Szechi; as a result “county electorates were small, usually less than a hundred voters”. Thus despite Angus’s relative insignificance compared to magnates like Argyll, he was one of the few Argyllshire men who could vote and his family therefore wielded considerable power. It is not clear when the Macalisters first gained possession of the property from which their territorial designation comes, but they clearly were freeholders almost from the start. The first mention we have of the lands of Loup is in 1481, when the king granted them, along with many others, to John of Islay (Lord of the Isles). The property seems to have been granted by him to the Macalisters who, as a sept of the Clan Donald living in the heart of the Lordship, were already John’s followers. Certainly by the time of the final Forfeiture, in 1493, the Macalister chief was holding Loup as a vassal of Macdonald of the Isles. At that point John’s lands in Kintyre reverted to the king, who apparently regranted Loup to the Macalisters, thereafter to be held directly of him. The rentals of 1506 and 1541 show the Loup property still in the hands of the Macalisters, and in 1605, Macalister’s charter for his crown holdings was confirmed. In 1607, Kintyre was granted to the Campbell Earl of Argyll in response to the Macdonald-Maclean feud. Argyll’s grant was ratified in 1617, after more trouble from the (now landless) Macdonalds of Dunyvaig. The earl was instructed not to let any of his new lands to anyone named Macdonald, Maclean, Macneill or Macalister. However, Hector Macalister, 6th of Loup, held his lands of the king, not Argyll; additionally, Hector had been too young to be involved in the various disorders of the early 1600s, so no punitive measures were taken against him. Still, holding one’s land in Kintyre required a diplomatic balancing act: Loyalty to the king served the Loup family well when Argyll fell from favour, but during the 17th century it was often a liability. The Macalisters didn’t always get it right; they did however seem to know when it was time to give up: As an adult, Hector narrowly avoided forfeiture (or worse) at the end of the Civil Wars by quickly switching sides when it became clear that Alasdair MacColla’s rising was at an end; his great-grandson, Alexander the 10th of Loup, was accused of treason for his involvement in the first Jacobite rising and almost certainly would have been forfeited had he not surrendered before he could be arrested. Being returned to Westminster as a knight of the shire for a Scottish county . . . required a successful candidate to exploit his local and family networks to produce a coalition of friends, neighbours and kinsmen sufficient to vote him in. The unanimous election of Lord Frederick Campbell, a brother of the 5th Duke of Argyll, to the post suggests that the men who met on this day at Inverary — including Angus Macalister of Loup — were those who had made themselves Campbell allies. Ultimately, however, Angus’s political realism could not save him from the biggest threat to 18th-century lairds: accumulating debt. He had already been sued, in November 1746, by creditors of his father Charles in attempt to collect on Charles’s debts. Before the end of the decade, his lands in Kintyre would be sold off by trustees. Although the designation ‘of Loup’ is still held by Angus’s successors, he was the last of this family to be called a freeholder of Argyll. A. Mackenzie, A View of the Political State of Scotland at the Late General Election (Edinburgh: Mundell & Son, 1790), p. 21. W. Ferguson, Scotland: 1689 to the Present, Edinburgh History of Scotland vol. 4 (Mercat Press, 1990), p. 72. Sankey & Szechi, “Elite Culture and the Decline of Scottish Jacobitism, 1716-1745” in Past & Present, No. 173 (Nov. 2001), p. 105. Origines Parochiales, vol. 2, part 1, p. 31. L. Timperley, A Directory of Land Ownership in Scotland, c. 1770 (Scottish Record Society, 2014), pp. 28-46. [T]here was a feud between the Macalisters of Loup and the Macdonalds of Largie, on the one hand, and the Macneills on the other hand. Alexander Macalister of Loup and John and Archibald Macdonald of the Largie family slew Malcolm Macneill, John MacQuarrie, and others, while Donald Balloch Macneill and his accomplices slew Finlay Carach Mac Dunsleibhe, Ewen Mac Lachlan, and others — all followers of the Macalisters of Loup or the Macdonalds of Largie. The Macalisters and the Macdonalds seem to have been the aggressors. Somerled MacMillan reports that the reason behind this feud was Macneill’s decision to become a vassal of Argyll, a decision that “incurred great displeasure among the supporters of the Islay and Kintyre branches of the MacDonalds”. On the surface, this seems plausible, particularly in light of the timing: This took place immediately after the Donald Gorm rising, yet another attempt by the Macdonalds to regain the Lordship of the Isles. But the Argyll family was out of favour for most of the reign of James V, while the head of the Clan Iain Mhòr, MacDonald of Dunyvaig, had been given much of Argyll’s authority in the southwestern Highlands and Islands. Anti-Campbell sentiment thus seems a less likely explanation in this instance than at some other times. One modern historian points out that this era was particularly noted for “repeated outbreaks of violence on various scales, from small numbers of victims being killed in minor scuffles to armed expeditions that were comprised of several score of fully-armed men who descended on their neighbours with the intention of killing people, burning property and driving off beasts”. And Philip Smith writes that while the Donald Gorm revolt took place in the north, “there had been feuding between families related to the Clan Ian Mór in the south”. So the raid on the Macneills might have been completely unconnected to either the Macneills’ relations with Argyll or the Clan Donald rising further north. Bond of Surety by James MacDonald of Dunnyveg. 1539. I James M’Connel be the tennor heirof becumis souertie to ane richt honorabill man Thomas Scot of Petgorno Justice Clerk for Alexander M’Alister of Loup, Archd. M’Charle and Johne M’zonil M’crannald Bayne that thai sall compeir befoir the justice or his deputtis the third day of the next justice aire of the schire quhair thai duel [dwell] or sounar upoun xv dayis warnying quhen & quhair it sal pleis the Kingis grace & lordis of counsale to underly the lawis of art & part of the slauchter of umqle Gillecallum m’nele Johnne M’Were and thair complices. At Edinr. the 31st July 1539. On the 15th of August the following year, Loup and two others were granted remission for these crimes, and by 1541 both Alasdair and Ranald were back in the king’s good books, named as landholders in the Kintyre rental of that year. It is interesting to note, however, that when the king appointed a constable for Tarbert Castle, Alasdair of Loup – the head of his kindred – was passed over in favour of his brother Donald, who does not appear to have taken part in the raids of 1539. Rev. A. Maclean Sinclair, “The Macneills of Argyllshire”, The Celtic Review, vol. VI (July 1909 to April 1910): 60; Sinclair gives the date as 1538, but all other sources say 1539. Philip Smith, “On the Fringe and in the Middle: The MacDonalds of Antrim and the Isles, 1266-1586”, History Ireland (Spring 1994): 19. The Macalisters of Loup, the Macdonalds of Largie, and the Gigha Macneills were all followers of the Clan Iain Mhòr. Campbell, vol. 2, p. 24. It is possible that these two incidents are, in fact, separate reports of the same raid. The Macneills of Gigha also held lands in Knapdale, and although the Reverends MacDonald say the Macneill attack was in Gigha, Campbell places both in Knapdale (though he treats them as distinct events). It seems odd to me that all of the charges brought against Loup seem to specify his murder of Macneill when the description of the later raid suggests that attack, if separate, would have been more charge-worthy. Ibid., p. 749; “M’crannald Bayne” was the patronymic of the Largie Macdonalds. On this day in 1940, the steamer SS Clan Macalister was destroyed by the Luftwaffe while taking part in ‘Operation Dynamo’, the evacuation of the British Expeditionary Force from Dunkirk in France. Eighteen people died in the attack and fourteen were wounded. The evacuation of the B E F, which had been fighting with France and the Low Countries against the advancing German army, became necessary when the Germans broke through the Allied line and overran Belgium and France in a matter of days. Germany now held most of the coast. As unoccupied territory shrank by the day, nearly the entire British Expeditionary Force, as well as French troops and fleeing Belgian units, began to converge in desperation on the tiny strip of coast that remained free. Sir Winston Churchill recalled, “The whole root and core and brain of the British Army . . . seemed about to perish upon the field or to be led into an ignominious and starving captivity” – and if the war against the Third Reich was to be won, there would have to be an army left to win it. On Sunday, 26th May, no other options remaining, an emergency evacuation got underway. [T]he docks were useless. Bombed incessantly over a period of weeks they were a mass of battered metal and broken walls; the basins were open to the tide; the gates wrecked and jammed; the cranes stood weakly on three legs or lay like stricken birds along the quays. And over them, all through the evacuation, hung the pall that was lit on its underside by the red flame of the burning warehouses. This meant that some method had to be found for picking up hundreds of thousands of men straight off the beaches. Part of the answer was the use of the now-famous “little ships” – more than 700 mostly private-owned yachts, lifeboats, fishing boats, etc., whose owners responded immediately to the government’s request for small craft that could be used closer to the shore. But these boats could take only small numbers of passengers, and those they carried were vulnerable to attack from above. What was really needed were small motor craft to ferry men out to the bigger ships that waited off shore – ideally something armoured, to offer some protection from the shells coming at them from enemy planes. As luck would have it, about a dozen such craft had been built recently, and crews were being trained to operate them. These assault landing craft [ALCs] “could carry 50 men per trip. . . . [they] had the shallow draught needed for moving over the shallows between beach and ships. They had twin engines and steel armour which was to prove its worth” under nearly constant shelling and bombs. “[T]he Admiralty . . . said they wanted the lot,” Bernard Fergusson reports, “and were sending a ship to collect them”. That ship was the SS Clan Macalister, a British cargo steamer built in 1930 for Clan Line Steamers, Ltd., of Glasgow. It was the third ship owned by the Clan Line to be so named. 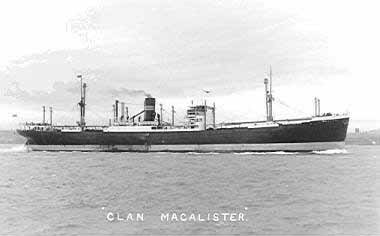 The first Clan Macalister had been sold in 1902; the second was a casualty of the first world war, torpedoed by a U-boat in 1915. At 6,787 tons, the third Clan Macalister was “nearly twice the size . . . of any other ship that took part” in the evacuation, according to A. D. Devine, and it had been requisitioned by the military specifically for Operation Dynamo. Its size, and the fact that it carried cranes, made it better suited than most to transport and then unload the ALCs. The ship also carried 45 sailors and two officers to manage and operate the ALCs. W J R Garner calls the landing craft that were brought by Clan Macalister “[t]he most important arrivals” of 29 May. Pressing in upon the narrow exit, both from the east and from the west, the enemy began to fire with cannon upon the beaches by which alone the shipping could approach or depart. They sowed magnetic mines in the channels and seas; they sent repeated waves of hostile aircraft, sometimes more than a hundred strong in one formation, to cast their bombs upon the single pier that remained, and upon the sand dunes upon which the troops had their eyes for shelter. Their U-boats . . . and their motor launches took their toll. But arriving in one piece was only half the battle. From the start, the Clan Macalister‘s mission ran into trouble. Captain Mackie remembered that “We started to discharge the [ALCs] and had just lifted our first into the air when the destroyer Vanquisher dashed past at full speed and set up so much wash as to cause the ship to roll . . . heavily”; the men moving ALC no. 4 lost control of it and it crashed down on ALC no. 18, leaving both unfit for service. At 15.45, as the other ALCs were being unloaded, the Clan Macalister was hit three times in an air raid, setting boilers on fire and igniting part of the magazine. Most of the evacuees who had been transferred to Clan Macalister from smaller ships, and some of the military personnel who had arrived with the ALCs, were taken on board the destroyer HMS Malcolm. Though Capt. Mackie resisted giving up on his ship and valiant attempts were made to put out the fires, eventually he was convinced to abandon ship and was picked up with the rest of the survivors by the minesweeper HMT Pangbourne. The Clan Macalister did not sink straight away; still visible from the air, the ship was hit repeatedly by German aircraft and burned for days. When it finally went down, it took five of the badly needed ALCs with it. Yet despite being sunk on its first run to Dunkirk, the SS Clan Macalister had made a significant contribution to the mission. Its cargo, the surviving ALCs, ferried thousands of troops from the beaches over the remaining days of the evacuation. It was partly because of these landing craft that nearly twice as many soldiers were rescued on the 29th (and again in the days that followed) than on the first days of the operation put together. Fergusson concludes, “the new landing-craft had proved their worth”. Though necessitated by military disaster, Operation Dynamo itself was an unparalleled success. Instead of the 20,000 – 50,000 men that those in the know thought might, at best, be evacuated, nearly 350,000 British and French soldiers were taken from the beaches of Dunkirk over the course of nine days. Devine, who was there, called it “the greatest rescue expedition in the history of mankind”. Stephan Wilkinson suggests that were it not for the evacuation of “almost the entire British Expeditionary Force and tens of thousands of French poilus” from Dunkirk, Britain might well have fallen to the Nazis, leaving the US, when it finally entered the war, to fight alone, without allies and without a staging ground for its air war against the enemy. There would have been no D-Day invasion, and the world might look very different today. As Churchill told the British people, “We must be very careful not to assign to this deliverance the attributes of a victory. Wars are not won by evacuations. But there was a victory inside this deliverance. . . .”. The SS Clan Macalister played a part in that victory. Today the ship lies on the ocean floor, classified by the UK Hydrographic Office as a ‘dangerous wreck, depth unknown’. Wreck report 138 (pdf): ‘SS Clan MacAlister’ (www.wrecksite.eu, accessed 19 May 2016); p. 3. Winston Churchill, speech delivered to the House of Commons on 4 June 1940; published in the Guardian, 20 April 2007. A.D. Devine, Dunkirk (New York: E. P. Dutton & Company, Inc. 1948), p. 27. This aspect of Dunkirk is so remarkable that it remains the image most people associate with the evacuation. A. D. Devine remarks that “the vast majority [of boat owners] made free and unconditional offers of their vessels for any purpose for which the Admiralty might see fit to use them; and with their boats a very remarkable proportion of the owners offered their own services” (Dunkirk, p. 34). Some – like the estuary cruiser the Elvin – were “refused [by the Navy] . . . and went anyway” (‘29th May 1940 – Nightmare‘, from The Dunkirk Project: An interactive installment by Liz Mathews). Bernard Fergusson, The Watery Maze: The Story of Combined Operations (New York: Holt, Rinehart and Wilson, 1961), p. 44. Devine, p. 107. Presumably he means ‘non-military ships’, because the destroyers at least were considerably larger. W.J.R. Gardner, The Evacuation from Dunkirk: ‘Operation Dynamo’, 26 May-June 1940 (Routledge, 2014), pp. 51-2. S. Wilkinson, ‘From Dunkirk, 1940‘ in Military History, November 2013: 23. General Reference Center, Web. 14 May 2016.
 wreck report 138 (pdf): p. 5. In December of 1689, Alexander Macalister (8th) of Loup was among a group of men named by the Scottish Privy Council as “suspected or scandled of treasone”; his rents were to be sequestered until he could be brought to trial. Also named were his allies, MacDonald of Largie and MacNeill of Gallachoille, along with numerous others. These men were accused of being “in actual rebellion and arms against their Majesties’ government and laws”, having continued to “perpetrate and carry on their wicked designs against their Majesties”. Just for good measure they were also charged with disturbing the public peace. The ‘Majesties’ in question were, of course, William and Mary, who had taken the thrones of Scotland and England the previous year. The suspicion of treason arose from the adherence of these men to King James VII, who was holding on in Ireland despite determined opposition from most of the Protestant establishment in his other kingdoms. That adherence had led Loup, Largie and Gallachoille, as well as other local lairds, to the Battle of Loup Hill in May, to James’s court in Ireland, and then in July to Killiecrankie, where they fought in the regiment of Sir Alexander Maclean under Viscount Dundee. The astonishing victory at Killiecrankie was followed in August by defeat at Dunkeld, and that defeat led Macalister of Balinakill and Macalister of Tarbert (both of whom apparently remained in Ireland with King James when their chief returned to fight under Dundee) to surrender to the authorities and take the Oath of Allegiance to the new monarchs. But Loup and his friends were not ready to give up. The question arises of why these men, and others like them, chose this dangerous allegiance. For much of their history the Macdonald-allied clans had been at odds with the Stewart (later Stuart) kings, several of whom made significant efforts towards ‘subduing’ the Western Highlands and Islands — particularly the clans that had followed the Lords of the Isles. After the final forfeiture of the Lordship, in 1493, Clan Donald septs (including the Macalisters) and other allied clans had rebelled repeatedly in attempt to restore it; repeatedly they were defeated, forfeited, and often restored only as vassals of the Campbells of Argyll, who acted as lieutenants for the king. But in the early decades of the 17th century the relations of these clans with the House of Stuart had begun to change. As disorder spread in the Western Isles, the Campbells became ‘the masters of aggressive feudalism’, especially under the eighth Earl of Argyll. Suspected of fomenting disorder and unrest among the western clans to justify his intervention on behalf of the Crown, his actions were largely responsible for the bitter enmity that subsequently divided the Campbells from the other clans in Argyll and the Western Isles, and especially the septs of Clan Donald. Thus when Alasdair MacColla arrived from Ireland in the 1640s, ostensibly to fight for King Charles I, many of the Western clans saw him not as a defender of the Stuart king or even of the Catholic faith (for many of them were now Episcopalians) but as an enemy of the eighth Earl — now Marquess — of Argyll, who was leading the opposition to Charles in Scotland. When Charles was executed in London, even Argyll was angered; Charles’s son was declared king of Scotland and the Scots as a whole rallied to Charles II. The new king’s defeat by Oliver Cromwell and his New Model Army in 1651 was followed by nearly a decade of English occupation. By the time King Charles was restored in 1660, most of the Macdonald clans were firmly in the Royalist camp, and it was Argyll, rather than the Crown, they considered a threat. None of them supported the invasion of the forfeited ninth Earl of Argyll in 1685, and all of them understood that with the ascension of William and Mary (whom the 10th Earl of Argyll supported), the Argyll family would also rise again. John Roberts writes: “There can hardly be any doubt that the chieftains of the western Highland clans were deeply alarmed by the prospect of Argyll’s restoration, which threatened them all to varying degrees.” And so in November of 1688 the Clan Alasdair lairds declared their support of Charles’s successor, James VII, and the close of 1689 found the Macalister chief facing arrest for treason. As it turned out, however, issuing a warrant for his arrest was easier than actually arresting him, and Alexander of Loup remained at liberty to fight once more for King James. Register of the Privy Council of Scotland, series 3, vol. XV, pp. 2-3. The Macdonald who was ‘of Largie’ at Loup Hill was Donald, who died at Killiecrankie; it is his brother Archibald who is named in the December Privy Council register. Register of the Privy Council of Scotland, series 3, vol. XIV, pp. 235-6. D. Gregory, The History of the Western Highlands and Islands of Scotland, from AD 1493 to AD 1625, 2nd ed., p. 192; C. Fraser-Mackintosh, The Last Macdonalds of Isla, p. 26. John L. Roberts, Clan, King and Covenant (Edinburgh University Press, 2000), pp. 9-10. On this day in 1563, a bond was signed at Brodick Castle between James Hamilton, Duke of Châtelherault, and Angus M’Rannald Moir M’Allister. As in most bonds, there is a grant of land (the ‘fourtie schilling aucht penny worth land of Kilpatrick and Drumgriner land within his gracis landis of Seskene [Shiskine], Ile and erldome of Arran’), in return for which Macalister promises to be an obedient tenant and to make sure his own tenants are law-abiding and loyal. Noticeably missing, however, is any promise of service to Châtelherault. Dr Jenny Wormald concludes that ‘although no doubt in practice Angus Macallaster served Châtelherault in very much the same way as did those who made bonds of manrent in Arran, nevertheless their obligations and undertakings were different’. Among Macalister’s obligations was a promise to assist the Duke in evicting any ‘rebellis and dissobeyaris’ from the island, leading W. M. Mackenzie to describe this Macalister as Châtelherault’s ‘henchman’. Perhaps Angus’s role was similar to that of estate factor in later times. In my boyhood days the M’Alisters were the most numerous clan in Shiskine. They occupied positions of trust in our public bodies. In fact, they ruled us both temporally and spiritually. A M’Alister would take as naturally to a Kirk Session as a Kerr or Kelso from Lochranza, would take to the water. Despite Mr Robertson’s fears nearly a century ago that the name would soon disappear from Shiskine, there are still Macalisters living there today. The identity of Angus M’Rannald Moir M’Allister is unclear, but the most likely reading of his name indicates that he was the son of someone known as Ranald Mòr and belonged to the Clann Alasdair. The fact that those living in Shiskine continued to use the name Macalister suggests that in this case it is in fact the family name rather than a changeable patronymic such as those being used at the time by Donald McAlester (MacDonald of Largie, whose father was Alexander mac Ranald Ban) and the chief of Clanranald (who appears in contemporary records as John Moirdearach Macalastair because of his descent from an Alexander in that family). It seems reasonably certain that Angus belonged to the Loup family or one of its branches — most early Macalister landholders in Bute and Arran were members of the leading families of the clan. One possibility is that Angus descended from the first Macalister on record in Arran, Ranald Macalister (or Reginald MacAlexander) who died in 1458. This Ranald had held extensive lands in Arran, at one point including Lochranza Castle, but for the last twenty years of his life had managed not to pay any rent at all, which eventually led to the loss of his holdings. We don’t know for sure who Ranald was, but Mackenzie agrees that ‘he was probably astray from’ the Loup family. Considering the years involved, however, it seems unlikely that Angus was this Ranald’s son. He might have been a grandson, but Reginald MacAlexander is nowhere referred to as Mòr, and if the term was added later to distinguish him from a son named Ranald, then Angus’s patronymic should be Mac Ranald Oig. As far as I know, the only Loup family member on record as Ranald Mòr in the early 16th century was a younger brother of Alasdair of Loup; he is named in the Assedation and Rentals of Crown Lands in Kintyre in 1541 as holder of the Dewpin property. My guess – and it is only a guess – is that Angus was a son of this Ranald Mòr. One problem with this theory is that neither of Ranald Mòr’s known sons was named Angus. However, at this point the younger children of landholders often did not merit notice by keepers of records, and there is no reason to think Ranald Mòr might not have had additional children. Whoever Angus really was, unlike Donald of Langilwenach he did not later receive a more important grant elsewhere, and so it seems that he remained in Arran and established the clan there. W. M. Mackenzie, The Book of Arran, vol. 2 (Glasgow, 1914), pp. 86-7. J. Wormald, Lords and Men in Scotland: Bonds of Manrent, 1442-1603 (Edinburgh, 1985), p. 58. A. I. Macinnes, Clanship, Commerce and the House of Stuart, 1603-1788 (East Linton, Scot., 1996), pp. 242, 244. This might reflect a Macneill forfeiture, as they were unequivocally Royalists during the Civil War – as opposed to Hector Macalister of Loup, who seems to have switched sides at least once and suffered little for his early allegiance to Alasdair MacColla. C. Robertson, “Clans of Shiskine Past and Present“, speech given 10 March 1936, Glasgow; printed by the Buteman, Ltd., no date given. Many of those whose lands were devastated by raiders from Kintyre were granted relief from their rents in especially bad years. Macalister however seems to have pushed this a bit too far! Kintyre Rentals, 1505-1710, transcribed by Judge A. I. B. Stewart & Andrew McKerral, 1987; p. 10. There was also in Arran the Clan Alasdair Beag, whose connexion to the Loup family, if any, is unclear. On this day in 1803, issue no. 5 of the Ayr Advertiser went on sale. A copy of this issue, held by the South Ayrshire County libraries, is the earliest known surviving issue of Scotland’s first weekly newspaper. It was discovered in January 2015 in an attic in Edinburgh. Issue no. 5 provides an interesting snapshot of life in Ayr in the Napoleonic period. One article noted that the Ayr races for the season had been cancelled, as “almost every Nobleman and Gentleman is doing duty with one corps or another in defence of the country”. Charles Somerville McAlester, 12th of Loup, was at this time one of the ‘noblemen and gentlemen’ of Ayrshire. In the 1790s, his father Angus had (with Charles’s consent) resigned the family’s properties in Kintyre into the hands of trustees, to be sold in order to pay off heavy debts – an unfortunate position in which many Highland landowners of this period found themselves. (Most of these properties, after several owners, ended up in the possession of the Glenbarr family.) However, Charles’s marriage in 1792 to the heiress of the Somervilles of Kennox, in Ayr, had restored the Loup family’s fortunes and brought them to live in Ayrshire, where Charles seems to have quickly involved himself in the county’s social set. It is likely that this included maintaining an interest in horse racing, which was very much a part of Ayrshire landed society. Although horse races had taken place since the 16th century all over Scotland, it was only in 1777, when the racecourse at Ayr was built, that racing really took off. Many races were part of – though not the purpose of – annual local fairs, but racing as an organised sport was controlled by the area’s landowners: the nobles and gentry mentioned in the Advertiser article. These landholders were the only ones whose horses could be spared regularly from the demands of farming, and they also had the influence needed to protect a form of entertainment that did not always meet with approval from some quarters. John Burnett, in an interesting article on this topic, points out that it is no coincidence to find horse racing developing and surviving as a sport in places like Ayrshire and Renfrewshire, which had a large number of landed proprietors, rather than in places like Aberdeen, where this class of people were fewer. As it happened, however, in 1803 there was little point in holding the races. The Peace of Amiens – a treaty signed the previous year with France – had broken down several months before this, and Napoleon was now gathering his forces and preparing to cross the Channel and invade. The men who were needed to keep the races going – and no doubt many of those who just enjoyed watching them – were all away preparing to protect the country. On the first of September 1803, Charles of Loup was serving as a captain with one of the corps mentioned in the article, the Ayrshire Militia. This force had been formed from the core of the 7th North British (Ayr and Renfrew) Militia, which had disbanded the previous year with the Peace of Amiens. It was reactivated (and renamed) in January 1803. The militias did not serve overseas, and as we now know, Napoleon never made it to Britain. However, local militias were considered an important part of homeland defence, and the Ayrshire Militia raised in response to the Napoleonic threat was not stood down until 1816. On this day in 1803, they were stationed in Perth, with more important things to worry about than missing the races. At this point it was actually the Air Advertiser; the spelling was changed in 1839 (British Newspapers On-line: Ayr Advertiser, accessed 31 August 2015). South Ayrshire Libraries, “Oldest known Ayrshire newspaper discovered“, South Ayrshire History blog, 10 January 2015. John Burnett, “The Sites and Landscapes of Horse Racing in Scotland before 1860” in The Sports Historian, No. 18, 1 (May 1998): 64, accessed 31 August 2015. Records of the Ayrshire Militia, from 1802 to 1883 (privately printed in 1884; published 2011 by South Ayrshire Libraries). On this day in 1506, ‘Donaldo Makalester’ is named among the numerous men in the Isle of Bute to whom the king gave new grants of lands they held there. The grant describes those named as hereditary tenants and tells us they have held their lands ‘ab antiquo’ (from ancient times). Many of these men do indeed bear names like Stewart and Bannatyne that are strongly associated with Bute. Macalisters have also been described as one of the ‘old native families of Bute’, but it is likely that in Bute, as in Arran, Macalisters in the early sixteenth century were still better known as ‘cursed invaders from Kintyre’, having raided there for generations. Though I have no direct evidence, I suspect that this Donald was Donald Dùbh, younger brother of the laird of Loup and eventual founder of the Tarbert family. Most of the early landholding Macalisters in Bute and Arran seem to have had connexions to one or another of the leading families (indeed, the leading families were the only ones in this clan to hold land anywhere at this point), and I am unaware of another Donald of note in the clan at this time. It’s possible that before he was appointed keeper of Tarbert castle in 1540, Donald Dùbh had made his home in Bute, much as two hundred years later his descendant Charles, of Tor in Arran, made his home on that island before succeeding as the 8th laird of Tarbert. Whoever Donaldo Makalester was, his lands (the southern part of a property called Langilwenach in the parish of Kingarth) were not be passed on to his heirs — male or female. In or before 1555, Macalister sold his Bute property to John M’Wyrartie and his wife Katherin Glas. Register of the Great Seal of Scotland, AD 1424-1513 (James Balfour Paul, ed. ; H M General Register House, 1882), pp. 635-636. James King Hewison, Isle of Bute in the olden time (Edinburgh: William Blackwood & Sons, 1893), p. 225. R. Mitchison, A History of Scotland, 2nd ed. (London: Methuen & Co., 1982), p. 78. Register of the Great Seal of Scotland, pp. 635-636. Origines Parochiales, vol. II, part I, p. 216. Killiecrankie was the climactic battle in the first Jacobite rising, which began a few months earlier when the Argyllshire clans learned that William of Orange had taken the throne and King James VII had fled to Ireland. In fact, nearly the entire force of ca. 2000 raised by Dundee consisted of (mostly West Highland) clansmen – some, but not all, following their chiefs. The clansmen rallied to Dundee for a variety of reasons, including religion (most of the Jacobites in all of the rebellions were Episcopalians) and politics. But Sir Alastair Campbell of Airds is probably correct in his assertion that their immediate motivation, “neither for the first nor the last time, seems to have owed much to a shared antipathy to Argyll and his Clan”. Indeed, with a new, Protestant king in place partly thanks to the Earl of Argyll, the chiefly line of Clan Campbell seemed poised to rise from the ashes yet again, and a resurgent House of Argyll threatened most of its neighbours for one reason or another. When Sir Alexander Maclean was granted a commission by the king in Ireland to raise a force in Kintyre, he found what Paul Hopkins calls the ‘non-Campbell clans’ in the north of the peninsula “unable to resist alone for long . . . but anxious to rise”. Dundee’s force seems not to have been taken all that seriously initially. Although General Mackay, the head of William’s forces in Scotland, “considered the highlanders the finest untrained soldiers in Scotland”, according to Hopkins, “he did not understand their manner of fighting, and had an incredibly crude and mechanical picture of a chief’s powers”, believing that no clansman would dare to act independently of his chief – let alone against his wishes. Mackay thus assumed that most of Dundee’s clansmen were there under duress rather than by conviction and would give way when faced with experienced military power. This view was shared by some in the government, who expected the Viscount’s clansmen would betray him when they learned there was a price on his head. But the Highlanders did neither. The immediate cause of the battle at Killiecrankie was the seizure of Blair Castle, ancestral home of the Murrays of Atholl, by Patrick Steuart of Ballechin on Dundee’s orders. Learning of the castle’s fall, Lord Murray hurried to its defence, but with a small force and little ammunition, he could only set up a blockade and write to the new government for help. In response, General Mackay headed north. On the 26th of July, Lord Murray withdrew by several miles, and Dundee with his Highland army arrived at Blair Castle. By the following afternoon, Mackay’s force – six battalions of foot and two troops of horse, with some ‘leather’ cannons (about 3,500 men) – had arrived. Mackay’s army considerably outnumbered Dundee’s, but the Highlanders had several advantages. First, in the words of John Roberts, “Dundee had executed what can only be described as a brilliant tour-de-force”: instead of taking the main road to the site of battle, he had led his troops up a back way, so that by the time Mackay saw them, they were uphill from the government forces, gaining a tactical advantage. Then, Dundee withheld the command to attack for two hours. Although there was a practical reason for this – the setting sun was in his warriors’ eyes – it must have been unnerving for those awaiting attack below. Third, Mackay was overly confident in the ability of his trained soldiers and horse to defeat what was (despite the image of Highland clans as violent, feuding warriors) essentially an untried force, most of whom had never before faced a battle. But the greatest advantage Dundee had at Killiecrankie was that a generation had passed since Montrose and MacColla overwhelmed their opponents with the Highland Charge. Lessons learned in previous wars had been forgotten, and Mackay’s army, arranged so that they stood only three deep (not nearly strong enough to withstand the charge), was unprepared for what was about to hit it. Just after 7 o’clock, as the summer sun was sinking just beyond Strath Garry . . . Dundee ordered a charge. Rushing downhill in the fashion of those who had followed Montrose and MacColla, the Jacobites let off a single volley, before falling on the enemy with their broadswords, slicing into Mackay’s line, and carrying away virtually the whole of his left wing and much of the centre. Mackay’s forces didn’t even have time to attach their bayonets before the Highlanders were on them, causing appalling injuries with their swords. The whole thing was over in about ten minutes. For the Jacobites, it was an astonishing victory, but it came at a cost that would prove unsustainable. Mackay’s total losses were greater, but he had more men to lose: The 600 or so Highlanders lost made up roughly a third of their army. Worse, Dundee himself was killed. Although others stepped in to command the Jacobites after the Viscount’s death, there was simply no one else who could truly lead them. The momentum that should have followed such a victory failed to develop; within a month the Jacobites would be scattered at Dunkeld, and although the rising would stumble on for another year, any real hope of success had died with John Graham at Killiecrankie. Macalister of Kinloch, as he was also known, is not named specifically in connexion with Killiecrankie. However, we know that he was with Loup and MacDonald of Largie at the start of the rising, that unlike Tarbert and Balinakill he apparently returned with Loup from Ireland, and that he was still with Loup and Largie (or Largie’s successor) when they finally surrendered the following year. It seems likely therefore that he also fought with them. James Philip of Almerieclose, The Grameid: An Heroic Poem Descriptive of the Campaign of Viscount Dundee in 1689 and other pieces, 1691 (published in 1888 by the Scottish History Society), p. 154. Sir Alastair Campbell of Airds, A History of Clan Campbell (Edinburgh University Press, 2004), vol. III, p. 65; other writers also stress the threat posed by Argyll to the clans involved. Hopkins, Glencoe and the End of the Highland War (Edinburgh: John Donald, 1998), p. 140. Chronicles of the Atholl and Tullibardine Families, collected and arranged by John, Seventh Duke of Atholl, KT (Edinburgh: Ballantyne Press, 1908), p. 299. Roberts, Clan, King and Covenant: History of the Highland Clans from the Civil War to the Glencoe Massacre (Edinburgh University Press, 2000), p. 188. Campbell Paterson, A Land Afflicted: Scotland and the Covenanter Wars, 1638-1690 (Edinburgh: John Donald, 1998), p. 288. A. H. Millar: “Killiecrankie described by an eye-witness.” Scottish Historical Review, no. 4 (1906): 63-70. On this day in 1836, a group of local abolitionists gathered at the home of James McAllister in Gettysburg, Pennsylvania. McAllister and his family operated a mill on this property, and in the decades to come, the mill itself would serve the anti-slavery cause. The abolitionists who gathered at McAllister’s home went on to form the Adams County Anti-Slavery Society, one of the earliest such societies. The society did more than attend meetings, though. Society members established a network of safe houses around Gettysburg where slaves escaping from the south could find rest, food, and a place to hide between the legs of their journey. Between 1850 and 1858, hundreds of escaping slaves were hidden in McAllister’s mill, which became one of the first Underground Railroad stops north of the Mason-Dixon line. This was risky not just for the slaves but also for the McAllisters. The Fugitive Slave Act of 1850 made it a crime to harbour an escaped slave, even in ‘free’ states like Pennsylvania, and with bounty hunters using hound dogs particularly active in Adams County, the risk of being caught was fairly high. Helping their father shelter the fugitives made a deep impression on McAllister’s children, who grew up hearing the harrowing stories of the people who hid in their mill. “Is it any wonder I grew up to young manhood hating slavery with a mortal hatred?” James’s son Theodore wrote years later. When the American Civil War broke out, five of McAllister’s sons went to fight for the Union, and one of them died in battle. Theodore himself was a prisoner of war at the notorious Andersonville camp in Georgia. But history was not finished with McAllister’s property – or his family. On the first of June 1863, twenty-seven years after the meeting at James McAllister’s house, Union soldiers faced off against Confederate soldiers right on McAllister’s doorstep. Macalisters (of various spellings) fought on both sides. The Battle of Gettysburg – one of the best-known battles in US history (partly because of President Lincoln’s famous speech there) – continued for three days, causing the deaths of many soldiers and considerable damage to the property. As the battle went on, James McAllister’s house became a de facto hospital for wounded Union soldiers; a confederate hospital was set up near the mill. McAllister’s daughters Mary and Martha were at home during the battle and did whatever they could to help the wounded. Many of the dead were buried near their home. James McAllister died in 1872. The mill had not been used in years, and after the family left, it sank into disrepair. Today, almost nothing remains of the buildings that saw so much action in the fight against slavery. Although the actual battlefield has been preserved as a historical monument, McAllister’s property, which is privately owned, was forgotten; for much of the 20th century, it was used as a municipal dump. In 2002, a local preservation group began pushing for the dump to be moved and the property to be marked as a historic site. Though the borough initially dragged its feet, McAllister’s Mill was finally recognised in 2011 by the federal government as one of several hundred US properties that have a verifiable connection to the Underground Railroad. A marker was erected, and with the cooperation of the current owner, tours began the following year. Gettysburg National Military Park hopes to purchase the property eventually. More information about McAllister’s Mill can be found at the McAllister’s Mill Underground Railroad site and the web site of the Historical Gettysburgh-Adams County preservation society. McAllister, Robert M.: “McAllisters at Gettysburg”, Mac-Alasdair Clan (Winter 1998): 169. Musselman, Curt: “McAllister’s Mill and the Underground Railroad”, in The Sentinel, Special Edition (National Park Service, 2013): 6-8. Stansbury, Amy: “McAllister’s Mill finally gets historical recognition”, The Evening Sun on-line, 4 August 2012 (http://www.eveningsun.com/gettysburgh150/ci_21236739/mcallisters-mill-will-finally-get-overdue-historical-recognition), accessed 29 June 2015. The Mason-Dixon line, established in the early 1700s to resolve a border dispute between Pennsylvania and Maryland, took on new meaning in the 19th century, when it became a symbolic division between states where slavery was allowed and Pennsylvania, where it was not. Technically, once a slave crossed the Mason-Dixon line, he or she was no longer a slave. However, after 1850 people fleeing slavery could still be hunted down north of the line. After it was all over, McAllister put in a claim for $1,200 in damages, according to the Battle of Gettysburg website (accessed 29 June 2015). Scot Andrew Pitzer, “Underground Railroad site recognized” Gettysburgh Times on-line (4 May 2011).